Since I finished Ishbel last week I've worn it over and over. The pattern, plus the color is so perfect for me. I also finished My Anthro-Inspired Scarflet. Here - have a look. It was loads of fun. I will definitely make more. But since it is right up next to your skin, I recommend some cashmere. The Brown Sheep worsted is a little itchy. I also picked up a new yarn this week. It is the Green Label Aran Weight, Midnight Colourway, from Tanis Fiber Arts. It was originally slated to be another Porom, but I'm now leaning toward Through The Loops Katie Beret. I'm a big fan of the designer, Kristin Kapur. I've already completed her Dr. G.'s Memory Vest (pics soon, I promise!) and have queued Sunkist Cardi and Rickenbacker Scarf. comes and goes. 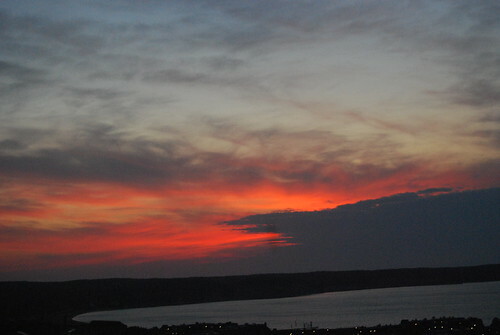 My previous Friday night looked like this, from our hotel room in Montauk. Six families, all sharing good times together for a whole weekend. This is when Life really is Good. That's a really pretty texture on your scarflet. It turned out nice!